I’ve never really played any real sports before (besides my high school gym class and I’m pretty sure that doesn’t count). However if I had, I’m convinced that I would be one of those athletes that are very VERY sore losers. I’m very competitive when placed in a competition setting or facing something that I really want to win or perform well in. When I lose or don’t do so hot…it ain’t pretty. Although I’ve never played sports, I can still know exactly what type of athlete I would be because as my blog so aptly puts it, Cooking is My Sport. When something I’m trying to do in the kitchen doesn’t go my way, or when I just plain mess something up…it ain’t pretty. The degree of my…distress (and that’s kinda putting it nicely) when having a kitchen fail mainly depends on the amount of time I’ve put into a dish and the amount/price of the ingredients I’ve invested into the project- probably about 90%. That other pesky 10% is composed of my ego- the part of me that refuses to accept that sometimes, I’m just going to mess up when cooking. It’s stupid, but there you go. The latest monkey on Jess the Cooklete’s back is yeast breads and sheet pans. Let me explain. I know how to bake yeast breads, okay? Yeast used to scare the crap out of me, but I’ve practiced enough with it by now to know what I’m doing enough to make it a pretty regular occurrence in my house. However, even with all my practice, there is still an aspect of my bread baking that still trips me up: letting the dough rest and rise on half sheet pans. It doesn’t work for me. Seriously, it really doesn’t. And for the life of me, I canNOT figure out why. Every time I make a recipe that asks for me to let my dough rise on a half sheet pan, it never does- or if it does, it’s only a liiiiiitle bit. How do I know that it’s the half sheet pans causing me trouble? Because I’ve used other dishes that have rims around them for the same purpose and have had beautiful results, that’s why. Right now, those alternates have been my glass Pyrex rectangular casserole dishes, my 9-inch cake pans, and my loaf pans- my dough absolutely blooms after resting in those. But the half sheet pans? I’m lucky if the dough will even rise in the oven while baking. I’m convinced guys: the half sheet pans are against me. This recipe was part of the reason that I came to the conclusion that the problem I was having wasn’t necessarily with me or the recipe, but with the flat, rimless vessels my dough was being put on. 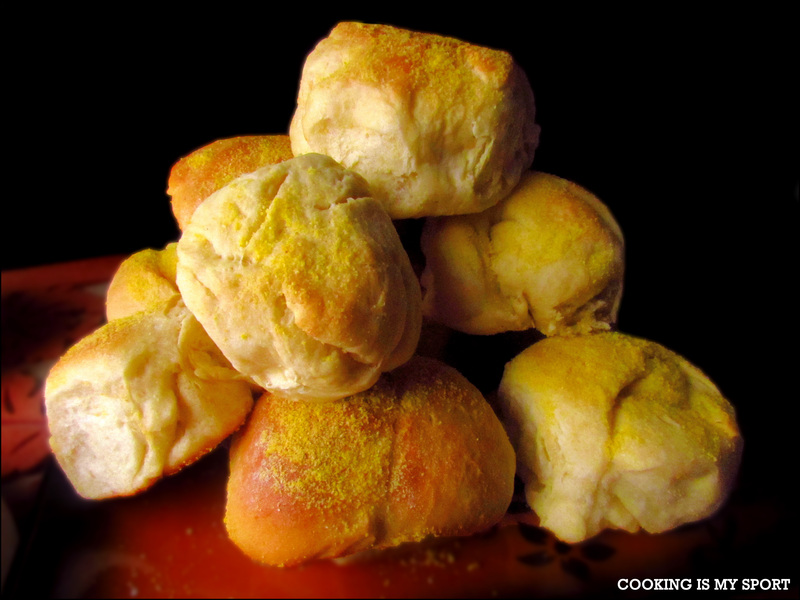 The first time I made it, I placed the dough on the sheet pans- the rolls didn’t rise. The second time, I rested them in my glass casserole dishes. Perfection. After that, every time I made these (as well as any other yeast bread) I refuse to use my half sheet pans. 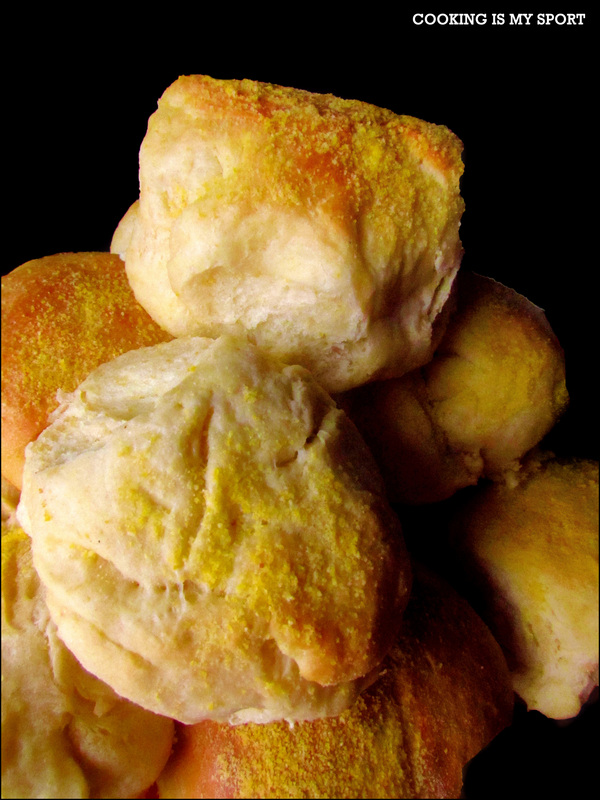 The result has been fluffy, round, and tender cornmeal dinner rolls that melt in my mouth and make me feel pretty good about myself as a Cooklete. I’ve read so many articles on yeast baking to try and find the answer to this little problem I have with half sheet pan dough rising, but so far have had no solid answers. So what do you guys think? If there are any yeast baking experts out there, please feel free to give me some advice. Is it just that the sheet pans are against me, or do you think it may be something else? 1. 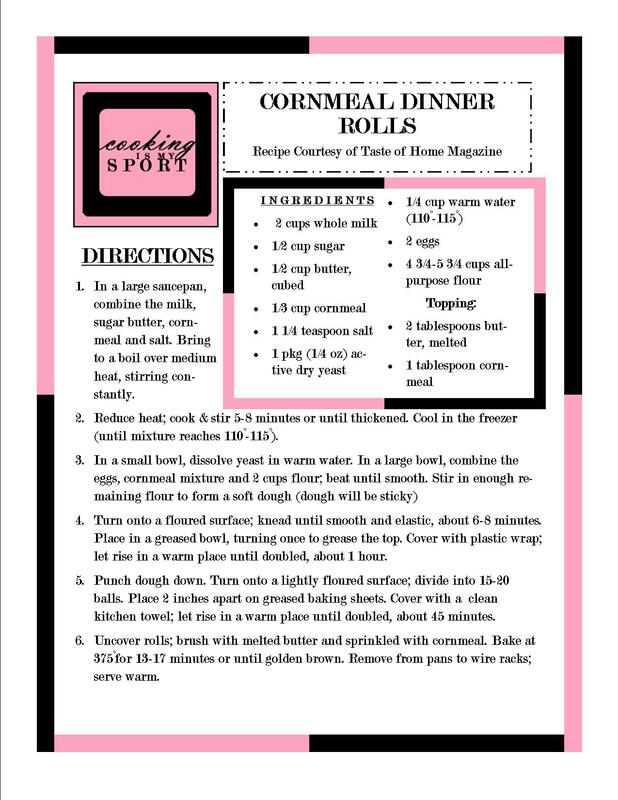 In a large saucepan, combine the milk, sugar butter, cornmeal and salt. Bring to a boil over medium heat, stirring constantly. 2. Reduce heat; cook & stir 5-8 minutes or until thickened. Cool in the freezer (until mixture reaches 110°-115°). 4. Turn onto a floured surface; knead until smooth and elastic, about 6-8 minutes. Place in a greased bowl, turning once to grease the top. Cover with plastic wrap; let rise in a warm place until doubled, about 1 hour. 5. Punch dough down. Turn onto a lightly floured surface; divide into 15-20 balls. Place 2 inches apart on greased baking sheets. Cover with a clean kitchen towel; let rise in a warm place until doubled, about 45 minutes. 6. 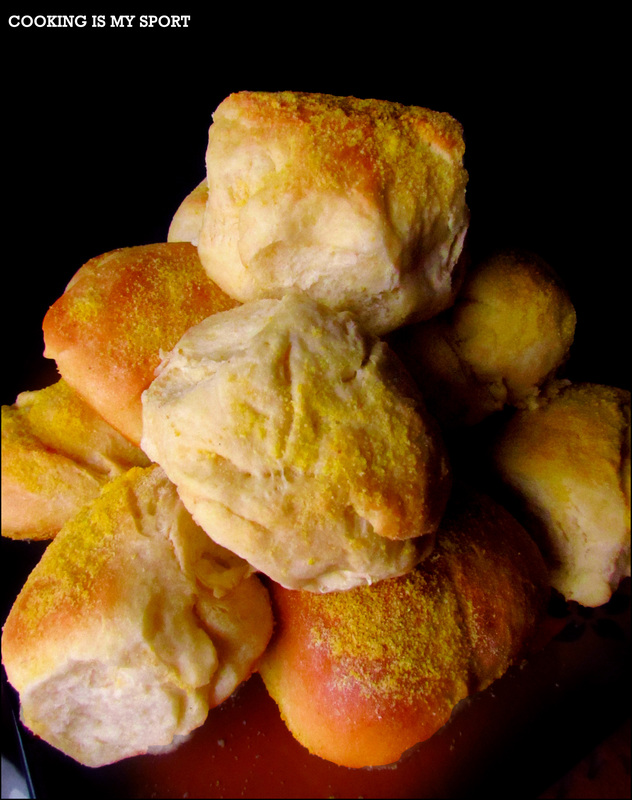 Uncover rolls; brush with melted butter and sprinkled with cornmeal. Bake at 375°for 13-17 minutes or until golden brown. Remove from pans to wire racks; serve warm. Ha! I’m still scared of yeast. I’ve managed to make bread and English muffins a handful of times but I’m still nervous whenever I read the words “rise” or “knead” in a recipe. 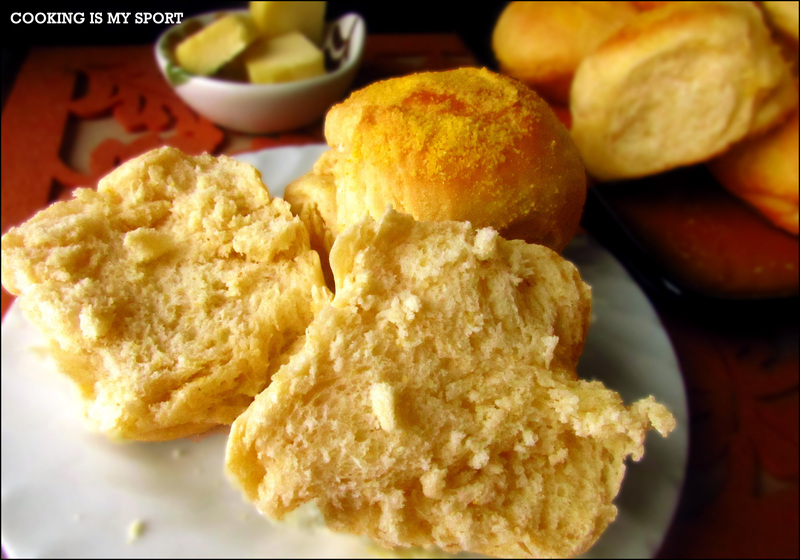 Clearly I’m no help in solving your sheet pan mystery…but those dinner rolls! They look delicious! I must make them soon.